Monarch Cove Condominiums are located on Horeshoe Bend and on the two-mile marker of the Osage by water. Our unit has 1170 square feet of living space, with a large wrap around deck. Available for your use is a twelve by thirty-two foot boat slip(must have at least 2 week notice). Just a short walk away is a lakefront heated pool, and hot tub. There is a lighted waterfront promenade for walking, or to access other buildings and boat docks. The bedroom has a queen-size bed and direct access to the deck. The sleeper sofa in the living room has a new memory foam mattress, which sleeps very comfortably. The unit is beautifully furnished . The condominium has two sets of sliding glass doors in the living room, which provides a wonderful view of the main channel. There is a gas fireplace for those chilly fall nights. The dining room and kitchen have maple hardwood floors and all the amenities necessary for an enjoyable stay. You will not be disappointed in this spot for a great vacation! Our March visit to the Monarch Cove condo this year was as expected; wonderful. The unit is spacious, clean, and nicely decorated with all working amenities. We enjoyed the gas fireplace, cable television, comfortable bed and Jacuzzi tub. The accommodating owners are easy to reach with questions. The off-season at Monarch Cove is delightfully quiet with a nice assortment of restaurants nearby whether we wanted casual or special dining. The unit has more than thirty steps from the parking lot to the front door but is worth the effort. We plan to visit again next Spring and highly recommend this unit. What a wonderful location and condo. Very easy to find and the space was wonderful. Definitely a place to go back to. The condo was great. It had everything we could need for a nice weekend getaway. It was clean, comfortable, and well maintained. For the first time in our adult lives, all of our children were out of town for the Thanksgiving holiday, so we decided to take advantage of a weekend getaway. This condo was perfect. All of the amenities: fireplace, full kitchen, spacious bathroom, jetted tub, lovely view of the lake, made this the perfect place to get away for a few days and recharge heading into a busy holiday season. We really only left the condo a couple times as we had all we need to relax and enjoy! We will stay there, again, and we highly recommend it to anyone looking for a home away from home. great place, great location, very easy to work with owners, etc etc etc. we loved it! Great location and view of the lake! The were no paper towels, napkins or TP. Would be extremely helpful to have some sort of guide of the TV channels and the ones you subscribe to. 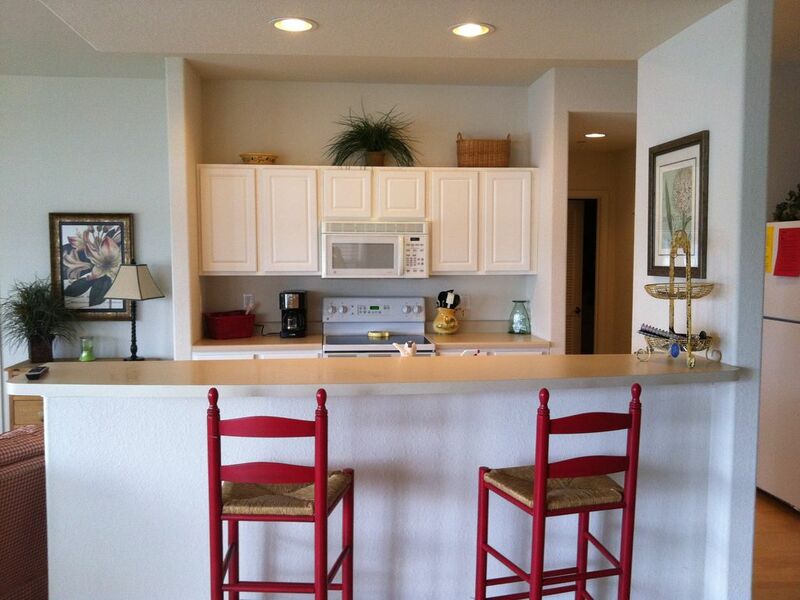 Lastly, the condo was adorable and huge for the price, but please soak that disgusting kitchen trash can in bleach. Robin I am sorry that you were unhappy with the supplies. I would like to say that there was toilet paper for you to get through a day or two. Also I provided laundry detergent, dryer sheets, hand soap, trash bags and dishwasher detergent. Most places I have ever stayed do not provide any of those things. I will be replacing the trash can. I assume someone didn’t use a trash bag. Again sorry you were not pleased with your stay.